Combine all ingredients in a large bowl except for bananas. Mix well. Add bananas and mix gently (to prevent bananas from being mashed) before serving. Serve and top with a scoop of vanilla ice cream. 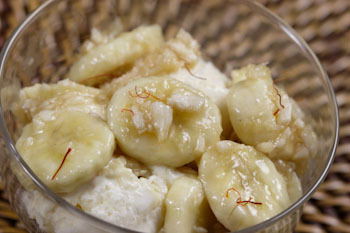 Bananas are coated with the sweet taste of coconut and honey. Cardamom imparts a subtle but distinctive flavor. Saffron adds a red-orange hue to the dish. It is very easy to prepare and is ideal to serve when you have unexpected company!